Saturday March 9th 2013 proved to be another long but successful day for the SEKU squad. The first event of the year turned out to be a very busy one with over 400 competitors attending the Legend tournament in Bracknell. The group has changed quite significantly over the past year with new faces making their mark in training and staking their claim for permanent places with outstanding performances. Sensei Dewey attended the event to give encouragement to the squad and Sensei Brian Smith was on hand during the day doing the same. As usual when the squad travel away we are joined by SEKU stalwarts Senseis Alan Lewis, Paul Moreby and Chris Carr and what a sterling job they did on the day, with the increase in the number of competitors severely stretching the under resourced officials and time keepers. There were some good performances throughout the day made more so by the increase in strong competition and increased size of categories especially the 12-15 kata & kumite and 16-20 male kumite. The cadet kumite now as large as the senior male individual kumite. Elliott Smith performed Gojushiho Sho to take the title in the junior kata. 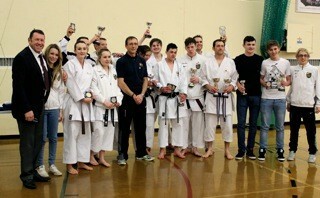 Senior Team Kata performed by Jason Hollister, Harry Miller and Mike Grimwood secured 2nd place. George Oliver, Ben Hobbs, Max Leach and Mike Grimwood 1st, 2nd and joint 3rd respectively in the cadet individual kumite dominating this category. The final was the same as last year but with a reverse result. Newer faces, Claire Johns, Rob Cooper, Richard Turpey (8th-4th Kyu Grand champion), Max Leach along with Allana Hollister have all been promoted to full squad members based on the performances and potential for future success. Senseis Terry Oliver and Steve Hollister agreed that this was another great effort from the squad and good preparation for the World championships In Germany in June.